Victory shall favor the bold! So bring it on—if you’ve got the metal. Warmachine is a fast-paced and aggressive 30mm tabletop miniatures battle game set in the steam-powered fantasy world of the Iron Kingdoms. Players take on the role of elite soldier-sorcerers known as warcasters. Though warcasters are formidable combatants on their own, their true strength lies in their magical ability to control and coordinate mighty warjacks—massive steam-powered combat automatons that are the pinnacle of military might in the Iron Kingdoms. Players collect, assemble, and paint fantastically detailed models representing the varied warriors, machines, and creatures in their armies. This is steam-powered miniatures combat, and your tabletop will never be the same! Privateer Press makes it really easy to get into Warmachine. They offer a simple 4 page rule set for free on their website that has all of the rules you need to play the game. Combine that with any faction’s starter “battle box” and you are ready to go. For a typical game of Warmachine, two players face off with a small skirmish force led by a single Warcaster. These warcasters are unique personalities that bring to the table a plethora of spells and abilities that drive they way your force performs. While extremely powerful, these warcasters can be easily defeated if overextended. Three other types of combatants fill in the rest of the skirmish force. You have warjacks, large warmachines that lumber across the battlefield leaving a wake of destruction in their path, units, groups of six or more infantry models that can form the bulk of your force, and solos, powerful individuals free to roam the battlefield filling in where their skills are most suited. One thing that sets Warmachine apart from other miniature games is the focus point system. Each turn, your warcaster has a set number of focus points that can be used to cast spells, augment jacks, or be saved to increase the warcaster’s defense. This adds a resource management aspect to the game. Do you use all of your focus to zap enemy models, or do you allocate some of it to your warjacks so they can move faster and hit harder? Each turn you will be faced with agonizing choices on how to utilize the resources that you are given. There is a lot of thought that goes into designing your skrimish force. Units and warcasters synergize with each other very well. A unit that might be underwhelming on it’s own can potentially dominate the battlefield when supported by the right solo or warcaster. In my experience, the combinations are limitless, and there is no single most powerful unit that shows up in every game. The miniatures themselves are top notch, both in design and quality. There is also new stuff coming out every month. Some people like this, while many do not. Although new models aren’t necessarily more powerful, it can be very daunting to stay on top of everything. Not knowing what you are up against can be the biggest disadvantage you can have. The rules themselves are solid and elegant, especially compared to other systems. It is very rarely that something comes up that the rules can’t explain. They are clear enough that there is not much open to interpretation. The game plays quickly and while it’s dice driven, it’s not a dice fest. You’ll rarely be rolling more than three or four dice at a time. I really enjoy this game. It looks beautiful on the table, it plays well, and even between games, I enjoy playing around with different force combinations, trying to find the best combination. But that’s the thing, there is no best combination, just many really great ones. Having played several ther mini-wargamers before I was blown away when I was introduced to Warmachine and its companion game Hordes. (It shoud be noted that these games are 100% compatable, they simply have a few key rules differences.) These gamers are easily the best and most fun games of thier type out there today! The game play is fast and furious and the tactics are as varied and dynamic as you can possible want. You can build your personal army to your specific tastes, and even include mercanaries into your force. Unlike other major miniature wargame companies in business today all factions in Warmachine or its companion game Hordes all receive new models and options at once. This means that you do not have to wait years before you get stuff, only months. Games can have a fast pace or a slow one, eitherway they will no doubt be fun. Overall the models are awesome, the rules are great and the backstory is some of the best out thier today. Having played many of the games workshop games, I had become tired of constantly trying to keep up with the newest army or book release. 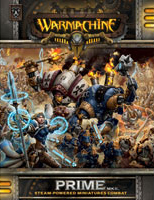 What appealed to me initially about Warmachine was that units released initially were still viable after many years of expansions and additions. Add to that a rich backstory and a army of loyal gamers and you have the makings of one of the best table top games I have ever played. Great support through the various cons (Temple con, Gencon, etc.) and wonderful volunteer gamers who work to show people how to pick up the game and run local tournaments show the game’s staying power and how dedicated people are to having it continue. Fun game to play win or lose, this is a game all should take a look at. I’ve only played this once, but the game left me with a really good first impression. The miniatures are beautifully crafted, and the game mechanics make for an experience that is loaded with strategy, tactics, and of course some luck. Although I am not an avid miniature wargamer by any means, I can see why games like this are so popular. If you have the chance to try this game out, I highly recommend it. Warmachine is a great miniatures game; it combines skill, knowledge and a pinch of luck if you want to win, with Warmachine even when you look down and out there is that small chance on a “balls to the wall” move that can win you a game. The models that Privateer press releases are amazing to paint and play with, they give a very stimulating look to an already awesome game. As time passes with this game in only continues to get better, the staff at Privateer Press have a great product and a great game for everyone who loves miniatures games. If you think you can’t your wrong! This is an excellent entry into the Table top world! great game mechanics! Add a Review for "Warmachine: Prime MKII"